A set of guidance documents has been made available to assist doctors and their patients who choose to prescribe medicinal cannabis in Australia under current access schemes. These have been developed based on reviews of available evidence for the use of medicinal cannabis in five different settings. Included is an overview addressing the evidence base for medicinal cannabis therapy generally as well as specific documents relating to medicinal cannabis in the treatment of palliative care, epilepsy, chemotherapy-induced nausea and vomiting (CINV), multiple sclerosis (MS) and chronic pain. 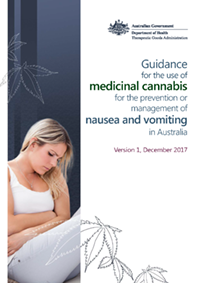 This document reflects the evidence supporting the use of medicinal cannabis in nausea and vomiting and the recommendations of the Nausea and Vomiting Working Group. Note: These guidance documents are based on evidence available at the time of publication and will be updated as new evidence emerges. Each document should be read in conjunction with the 'Guidance to the use of medicinal cannabis in Australia - Overview'. The Australian Government Department of Health commissioned a team from the University of New South Wales, University of Sydney and University of Queensland under the coordination of the National Drug and Alcohol Council (NDARC) to review the available evidence for the use of medicinal cannabis in the above five settings. The researchers conducted a review of previously published reviews from multiple databases such as Medline, Embase, PsychINFO and EBM Reviews based on PRISMA. PRISMA is the Preferred Reporting Items for Systematic Reviews and Meta-Analyses, and is an evidence-based minimum set of items for reporting on randomised controlled trials (RCTs). These guidelines have been developed because of concern for low quality trials and aim to improve the quality of medical research, remove bias and improve transparency and accurate reporting of findings. Searches were guided by a specialist Librarian using specific search terms and were limited to studies published between 1980 and early 2017. Two reviewers independently examined titles and abstracts for relevance using Covidence Software and the Cochrane Risk of Bias Tool was used to assess studies, aiming to increase accuracy. The GRADE (grading of recommendations, assessment, development and evaluation) approach, an internationally recognised standard applying to weighting of evidence in scientific and medical literature was used to evaluate the quality of evidence. In July 2017, the department also convened five separate Working Groups to consider the available evidence for the use of medicinal cannabis in the treatment of each of the settings. The five groups consist of individuals from a wide range of backgrounds and organisations, including senior staff from each state and territory Department of Health, fifteen healthcare professional organisations, clinical staff from twenty-nine hospitals and healthcare systems, fourteen outpatient or Primary Health Networks and eighteen consumer representative groups. Where clinical practice guidelines exist for the management of nausea and vomiting occurring in each of these specific circumstances, these should be considered the current standard of care. The current, internationally recognised, clinical practice guidelines for the prevention and management of CINV and RINV are produced by the American Society of Clinical Oncology (ASCO), Multinational Association for Supportive Care in Cancer (MASCC) and European Society of Medical Oncology (ESMO). These serve as the standard for patient management[1,2]. National and international guidelines for the prevention and management of CINV/RINV developed for the Australian context, in addition to specific cancer treatment protocols are presented on the eviQ website. Herein, specific antiemetic recommendations are documented for each chemotherapy or radiotherapy treatment protocol. The prevention and management of CINV in children with cancer is addressed in the Children's Oncology Group Guidelines (2017) and is included within the MASCC/ESMO Guidance[3,4]. The standard management of CINV is directed according to the relative emetogenicity of the chemotherapeutic regimen being received[5,6,7,8. There are reports that several medicinal cannabis products have relieved the symptoms of CINV when compared to placebo. Of the International Clinical Practice Guidelines, only the ASCO clinical practice guideline for CINV contains a statement regarding the use of medicinal cannabis in the management of CINV, for use after registered therapies have been tried and failed. Only one product is registered by the US Food and Drug Administration (dronabinol, trade name Syndros) for "nausea and vomiting associated with cancer chemotherapy in patients who have failed to respond adequately to conventional antiemetic treatments". There is currently no evidence from in-human studies that medicinal cannabis has any anti‑cancer activity. Chronic disease-associated nausea and vomiting may occur in a diverse range of conditions, including AIDS-defining illnesses, gastroparesis, intestinal motility disorders, and cyclical vomiting syndrome. The management of acute PONV in Australia is typically according to locally developed hospital guidelines. The management of acute PONV is outside the scope of this document. Owing to its safety profile, the use of medicinal cannabis in pregnancy is contraindicated. The management of nausea and vomiting in pregnancy is outside the scope of this document. There is currently only one cannabinoid (nabiximols/Sativex) that is listed on the Australian Register of Therapeutic Goods (ARTG). This product is not indicated for the management of nausea and vomiting. This document provides guidance for health professionals in the use of an unapproved medicine, in the context of limited evidence of efficacy for the treatment of nausea and vomiting. It also addresses the tension between patient autonomy and the underlying therapeutic principle to 'do no harm' and intends to support patients who may wish to use an unapproved therapeutic good. The scope of the document is broad given the limited evidence available and does not encompass all clinical conditions where nausea and vomiting may occur. Guidance can only relate recommendations to the condition, drug and dose which have been studied. For example, evidence of efficacy in nausea from one product, and dose, should not be extrapolated to treatment of vomiting with the same product and dose. There are limitations in how the clinical evidence was obtained and reviewed. Dose-response information for efficacy is lacking, in particular for starting doses. This is particularly relevant when applying data obtained from younger adults to the elderly, or people with hepatic or renal impairment. Dose-response information for toxicity is also lacking, particularly for side effects which may occur at different doses and before efficacy is evident. There is no dose equivalence for safety or efficacy data between medicinal cannabis products or between specific products and registered medicines which are current standard therapy. There is an absence of information regarding drug-drug interactions, for medicines of any class, arising from medicinal cannabis administration. There is no long-term animal or human data on which to model or predict toxicity. This is most relevant for use in pregnant women, children and young adults. For paediatric patients, there is no standardised dose regimen, no efficacy data presented separate from that for adults, no information on the interaction with other medicines, and no information on the relative incidence of adverse events in children as compared to adults. Thus the use of medicinal cannabis in children with nausea and/or vomiting from any cause is not supported. As noted previously, use of medicinal cannabis for the treatment of nausea and vomiting in pregnancy is contraindicated. As with all therapies, medical practitioners must exercise their professional judgment in determining if medicinal cannabis products are an appropriate treatment for an individual patient, and obtain informed consent from them before administration. At this time, the use of medicinal cannabis for the treatment of nausea and vomiting in managing the adult patient's symptoms should be considered only where conventional treatments have been appropriately tried and proven unsuccessful. The most recently registered classes of medicines for the treatment of nausea and vomiting which are efficacious have superseded those against which medicinal cannabis products have been studied. Medicinal cannabis products are therefore likely to be inferior to newer agents. It is recommended that the treating physician initiate medicinal cannabis only after an accepted clinical algorithm has been appropriately followed and demonstrated to have failed, and where not otherwise contraindicated. In the absence of high-quality evidence, the treating physician should consider the risks and benefits of either medicinal cannabis monotherapy, or co-prescription of medicinal cannabis with registered medicines. There is a paucity of evidence for the use of medicinal cannabis to prevent the onset of nausea and vomiting. The published clinical evidence is of moderate quality at best. There is no current high quality evidence for advocating medicinal cannabis in the treatment of established nausea and vomiting in adults in any clinical situation where registered antiemetics have not already been used according to accepted condition-specific clinical practice guidelines. Pharmacokinetic and pharmacodynamic interactions of medicinal cannabis products with chemotherapy and other medications are predicted but as yet not fully elicited. There is an absence of data as to an accepted duration which may be considered a suitable period to determine efficacy. Medicinal cannabis may be assessed to treat intractable symptoms which are ineffectively managed by other modalities, but should be stopped if significant adverse effects occur or lack of benefit is demonstrated. This therapeutic use is experimental. Patients and prescribing clinicians should be aware of adverse events—such as somnolence, dizziness, euphoria or gastro-intestinal disturbance—that may impact the overall aims of therapy. Adverse events, and revision of the dosing of medicinal cannabis, should be evaluated and managed on a case-by-case basis by the treating physician. Oversight by the Therapeutic Goods Administration (TGA) of the quality of medicinal cannabis preparations, including the quantity and compositions of cannabinoids supplied in products, is important to protect the health of the Australian public. High-THC medicinal cannabis products can sometimes be effective for nausea and vomiting and should only be prescribed only after newer standard approved treatments have failed and where otherwise not contraindicated. as secondary end points: subjective experience of appetite, subjective feeling of nausea, patient preference for medicinal cannabis versus comparator (in cross-over trials). Although there are significant limitations of this data (unknown product constituents in some, route of administration and doses, substantial age of the clinical evidence), a potential benefit in CINV in comparison to placebo has been suggested. Note that there is no consistently reported beneficial effect of medicinal cannabis in the management of vomiting occurring without nausea. There are low to moderate quality reports that dronabinol, as compared to placebo, may increase appetite in people living with AIDS-defining illnesses. To date, improvement in appetite has not been clearly demonstrated from the use of either levonantradol in patients with CINV, or tetrahydrocannabinol (THC) cannabidiol in patients with cancer-associated anorexia. There is no data to recommend either a specific starting dose or maintenance dose according to the clinical condition being treated. There is little information on dose-response in the treatment of nausea and vomiting. In general, starting doses should be low, and the dose titrated in response to lack of efficacy, until toxicity outweighs any benefit. The prescribing doctor should collect pharmacovigilance information. This will help refine guidance documents and provide additional cumulative safety data. In the studies included in the review, patients who received medicinal cannabis were more likely to withdraw from clinical trials for any reason, i.e. either lack of efficacy or adverse effects, than those who received either a prescribed antiemetic or a placebo[9,10,11,12]. Poor compliance to treatment with medicinal cannabis delivered by smoking, with 24 per cent of patients withdrawing due to lack of tolerance of the method of administration. In children with CINV treated with nabilone, study withdrawal due to the onset of drowsiness, dizziness, hallucinations mood change or hallucinations were commonly occurring (in >1 per cent to <10 per cent), or very commonly occurring (in >10 per cent) of patients observed. In addition, the onset of debilitating adverse effects of nabilone was shown to result in deferral of the patient's scheduled chemotherapy regimen[14,15]. When medicinal cannabis was combined with another antiemetic therapy, there was no difference in treatment withdrawals compared to patients receiving the other antiemetics as a monotherapy[16,17]. However, there is no evidence to support a synergistic effect of medicinal cannabis with any other registered class of antiemetics. In the absence of strong evidence for specific dosing and administration information of specific preparations of cannabis in managing nausea and vomiting, the treating physician who elects to initiate therapy should assess the clinical condition of the patient and monitor response to treatment. There is little evidence based on the studies identified in the systematic review to inform decisions about the timing of therapy, duration of therapy and timing of treatment discontinuation. Details of the incidence and severity of adverse events with most medicinal cannabis products are lacking, as reported in the literature. dry mouth (proportion not reported). There are no data regarding drug-drug interactions with therapeutic anti-nausea and vomiting agents of any class. Data is insufficient to provide specific advice to prescribers regarding the need for dose modification of prescription medicines co-administered with medicinal cannabis in adult patients. There is evidence that for children administered nabilone for CINV, their chemotherapy regimen had to be delayed due to the onset of adverse effects due to medicinal cannabis. There is no data regarding the appropriate starting dose, or maintenance dose, of any medicinal cannabis product for patient groups who may be considered at greater risk of adverse effects—for example, the elderly, patients with hepatic or renal impairment, or those at the extremes of body weight. There is little information on dose-response. Starting doses should be low, and the dose increased in response to lack of efficacy until toxicity outweighs any benefit. There is an absence of high-quality evidence for the use of medicinal cannabis for patients with acute onset nausea and vomiting, where it would be expected that currently registered medicine(s) would be prescribed. The efficacy of the most recently registered antiemetics has surpassed that of the registered medicines used as comparators in studies of medicinal cannabis. Furthermore, off-label uses of registered medicines which have off-target anti-nausea effects may be considered appropriate for the treatment of CINV, as is consistent with published clinical practice guidelines. Patients with CINV should first be treated according to the ASCO, MASCC/ESMO (2016) clinical practice guidelines, nationally accepted guidelines (eviQ) or other recognised locally-accepted treatment guidelines. There is an absence of reliable evidence of the efficacy of medicinal cannabis in the treatment of CINV according to the relative emetogenicity of chemotherapeutic regimens, or in comparison with currently available antiemetic therapies, which would be sufficient for clinicians to consider the use of medicinal cannabis ahead of those medicines described in the clinical practice guidelines above. The NDARC review (see Appendix A) identified ten reviews (comprising 57 studies) which assessed the outcome of complete control of CINV. However, these studies assessed medicinal cannabis products against medicines which were historically used (and some of which have been superseded), or against placebo. Overall, there was moderate-quality evidence that the pharmaceutical cannabinoid products dronabinol and nabilone were more effective than placebo, and at least as effective as the antiemetics with which they were compared to antiemetics (prochlorperazine, metoclopramide, thiethylperazine, domperidone, chlorpromazine, haloperidol, alizapride) at achieving complete control of nausea and vomiting in CINV[20,21,22,23,24]. There was more mixed evidence for the effectiveness of other cannabinoids in CINV. One review included low quality evidence, based on a small sample size, that nabiximols were more effective than placebo in achieving complete control of nausea. Three reviews provided low to moderate quality evidence that levonatradol did not exhibit superior antiemetic efficacy to the antiemetics prochlorperazine and chlorpromazine in CINV[26,27,28]. There were mixed conclusions in the reviews regarding the use of cannabinoids to control nausea and vomiting in CINV. One of the highest quality reviews concluded that there was low quality evidence that dronabinol and nabiximols reduced CINV. In contrast, another moderate quality review concluded that dronabinol or THC were not more effective than placebo. Further, the review concluded that while dronabinol had better acute antiemetic efficacy, cannabinoids nabilone and levonantradol did not have superior antiemetic efficacy to "conventional" antiemetics. A high quality Cochrane review concluded on the basis of four studies that there was low quality evidence favouring the use of medicinal cannabis in treating CINV. Complete control of nausea was typically measured by self-report ratings on visual analogue scales (VAS). Six reviews reported data on nausea in patients receiving cannabinoids for patients with CINV and late-stage AIDS-defining illness[33,34,35,36,37]. Overall, there was moderate quality evidence that nabilone was more effective than placebo, and at least as effective as the active comparators prochlorperazine, metoclopramide, domperidone and chlorpromazine, in completely controlling nausea in CINV[118,11,12]. Four reviews included five individual studies that provided low to moderate quality evidence for a mostly positive effect of dronabinol in controlling nausea for CINV[38,39,40]. One high quality review reported a combined analysis of the effectiveness of nabilone, THC and dronabinol at controlling nausea in CINV. It found no difference in the proportion of patients reporting no nausea after receiving cannabinoids compared to patients receiving placebo. In contrast, a low quality review (AMSTAR 4 of 11) concluded that medicinal cannabis was more effective than active comparators and placebo in completely controlling CINV. The review reported a combined analysis of nabilone, dronabinol and levonantradol which indicated that medicinal cannabis was more effective than placebo (RR=1.21, NNT=8.0) and active comparators (prochlorperazine, metoclopramide, chlorpromazine, thiethylperazine, haloperidol, domperidone, alizapride) (RR=1.38, NNT=6.4). These differences were small, however. Complete control of vomiting in CINV was measured as either the reported absence of vomiting, or the number of reported episodes of vomiting. Most studies for this outcome were measured in response to the administration of chemotherapy and were included in five reviews[43,44,45,46,47]. There was low to moderate quality evidence reporting the effectiveness of nabilone and dronabinol as more effective than placebo in completely controlling vomiting in CINV (total of 23 studies in five reviews[48,49,50,51]. There was limited evidence that levonantradol (one study, in two reviews[52,53]) and cannabis sativa (one study, in one review) were more effective than placebo in achieving complete control of vomiting in CINV[55,56,57]. One low quality review concluded that smoked cannabis sativa was significantly better than placebo in controlling vomiting for patients experiencing CINV. No specific conclusions were drawn about levonantradol but moderate quality evidence suggested that it may reduce vomiting in CINV compared to active comparators and placebo[59,60]. Several reviews reported data on the effects of medicinal cannabis on subjective measures of nausea using VAS scales in patients experiencing CINV[61,62,63]. Three reviews included eight studies of low to moderate quality that reported dronabinol was as effective as prochlorperazine at reducing nausea for patients with CINV[64,65,66]. In four reviews there was low to moderate quality evidence that nabilone was more effective than placebo, and at least as effective as the antiemetics prochlorperazine and domperidone, with which it was compared, in reducing nausea in CINV[67,68,69]. One review included one study of low quality that reported THC extract reduced nausea in CINV. One review included one study with evidence of unclear quality that found no difference between smoked cannabis sativa and active comparator thiethylperazine in self-reported (or nurse observed) nausea severity in patients experiencing CINV. The review did not state whether either drug was successful in reducing or controlling nausea. One review included a moderate quality study which reported that CINV patients receiving levonantradol experienced less nausea and vomiting than patients receiving prochlorperazine. There are nine studies reporting effects on appetite during use in patients with CINV, all of which are Grade C evidence. These arise from use with nabilone (seven studies of low to moderate quality reported mixed results), THC (one low quality study had mixed results) and Levonantradol (one low quality study demonstrated no significant difference compared to an active comparator). Evidence regarding the use of medicinal cannabis products for chronic disease management is limited to patients with cancer (in a non-palliative setting) or for individuals with AIDS-defining illness. There was some moderate-quality evidence for nabilone being more effective for controlling nausea in individuals with late-stage AIDS-defining illness as compared to placebo. Several reviews have reported on subjective experience of nausea in patients with advanced cancer, and late-stage AIDS-defining illness[75,76,77,78,79,80,81]. One review included one moderate quality study which reported that a THC:CBD combination was more effective than placebo in reducing nausea in patients with cancer-related anorexia. The authors noted that these trials did not consistently observe benefits or drawbacks when adding CBD and THC to therapy. Appetite was measured in some studies of patients experiencing CINV[83,84,85]. There was low to moderate quality evidence reporting mixed effectiveness of nabilone and THC at improving appetite in patients experiencing CINV[86,87]. Two reviews reported individual studies of the effects of cannabis sativa on appetite in patients experiencing CINV or AIDS-related nausea[88,89,90,91]. One review reported moderate quality evidence of a non-significant difference in appetite between levonantradol and an active comparator chlorpromazine in patients experiencing CINV. No reviews drew specific conclusions on the potential for cannabinoids to increase appetite in patients experiencing CINV. Subjective experience of effect on appetite was most often measured in studies in which medicinal cannabis was administered to individuals with HIV/AIDS[93,94,95]. There was a small amount of low to moderate quality evidence that dronabinol was more effective than placebo at improving appetite in individuals with AIDS-defining conditions. No reviews drew specific conclusions on the potential for cannabinoids to increase appetite in patients experiencing cancer, or AIDS-related nausea. There is an absence of dose recommendations for the management of nausea and vomiting in children. There is an absence of dose recommendations for the management of nausea and vomiting in patients with concomitant hepatic or renal impairment. There is also an absence of dose recommendations for the management of nausea and vomiting in elderly patients. There is an absence of information regarding drug-drug interactions and recommendations for dose modification in any patient group. The use of nabilone for the treatment of CINV was reported in reviews using doses between 1mg and 10mg one to five times a day. However, in studies reporting effectiveness, doses between 1mg and 4mg at one to four times a day were used[107,108,109,110,111,112,113,114,115,116]. Reviews reported patients receiving THC for CINV had received 10mg between four and eight times a day, or 10mg/m2 body surface area at four to six times a day. Levonantradol was administered at 0.5mg to 4mg between one and four times a day. Use of nabiximols was included in one study of 16 participants who received 2.7mg THC: 2.5mg CBD between two and eight times a day. In observational studies of effectiveness, doses of Dronabinol used ranged 2.5mg to 10mg at two to three times a day. One observational study of the use of nabilone reported use of doses between 0.5mg and 10mg one to two times a day. *No studies of these medicinal cannabis products have been performed against the most recently approved antiemetics which are considered the most efficacious available, in adequately designed and performed randomised clinical trials. Dronabinol was administered in a standardised oral capsule form for patients experiencing CINV, nausea and vomiting associated with AIDS-defining conditions, or other cancer-related nausea and vomiting. Nabilone was administered in a standardised oral capsule form for patients experiencing CINV, nausea and vomiting associated with AIDS-defining conditions, or cancer-related nausea and vomiting. Cannabidiol was administered in an oral capsule form for patients experiencing CINV, and other conditions that reduced appetite. Cannabis sativa was administered in herbal cigarette form for patients experiencing CINV and nausea and vomiting associated with AIDS-defining conditions. It is uncertain how successfully these products were standardised. Levonantradol was administered as a standardised intramuscular injection for patients experiencing CINV. Nabiximols or THC:CBD mixture was administered as a standardised oromucosal spray for patients experiencing CINV or cancer-related appetite suppression. Studies were assessed for their quality based on the criteria that the Cochrane Collaboration uses to evaluate possible methodological flaws in clinical trials. The complete control of nausea and vomiting (absence of nausea and vomiting without the use of rescue medication) in the acute phase (within 24 hours of treatment with chemotherapy) and in the delayed phase (after 24 hours of treatment with chemotherapy) of nausea and vomiting. Complete control of vomiting (absence of episodes of vomiting without use of rescue medication) in the acute and delayed phases of nausea and vomiting. Complete control of nausea (absence of episodes of nausea without use of rescue medication) in the acute and delayed phases of nausea and vomiting. Subjective experience of appetite (using self-reported scoring system such as visual analogue scale). Subjective experience of nausea (also using self-reported scoring system such as visual analogue scale, for number, duration and severity of episode). Study withdrawal due to any reason. Cross-over studies only: participant preference for one or other of the interventions (cannabis or control). Adverse effects, including 'feeling high', sedation, euphoria, dizziness, heightened sense of anxiety or agitation (dysphoria), depression, hallucinations, paranoia, hypotension, focal dystonia, extrapyramidal effects and oculogyric crisis. The following secondary outcomes for nausea and vomiting associated with HIV/AIDS as suggested by Lutge et al. Types of participants: The review considered studies that included participants of any age, with any type of nausea and vomiting but the primary focus was on emesis occurring in cancer patients undergoing chemotherapy. Types of intervention: The review considered reviews of studies that evaluate plant based and pharmaceutical cannabinoids administered to prevent or treat nausea and vomiting, particularly related to cancer treatment and secondarily in cancer and AIDS-related nausea. The review considered studies of: tetrahydrocannabinol; cannabidiol; combination tetrahydrocannabinol + cannabidiol; cannabis sativa; and where evidence exists, other cannabinoids e.g. tetrahydrocannabinolic acid (thca), cannabidiolic acid, cannabidivarin, and the synthetic delta-9-tetrahydrocannabinol formulations nabilone and dronabinol). Types of studies: We included reviews of both experimental and epidemiological study designs and so included randomized controlled trials, non-randomized controlled trials, quasi-experimental, before and after studies, prospective and retrospective cohort studies, case control studies and analytical cross sectional studies. Papers describing mechanisms of cannabinoid action, commentaries and clinical overviews that did not present the results of studies were not included in the review. Review quality was assessed using the AMSTAR measurement tool of methodological quality of systematic reviews. The AMSTAR tool documents assessed risk of bias at the review level. To identify reviews conducted methodologically, and to minimise bias at the review level in study selection, each identified review was required to meet criterion 3 and 6 of the AMSTAR tool at a minimum. This reflects reviews that were conducted with a comprehensive search and those that, at a minimum, describe the characteristics of the included studies. Studies were defined as high quality if they had six to seven factors with low risk of bias, as moderate quality if they had three to five factors with low risk of bias, and as low quality if only zero to two factors of the seven were classified as low risk of bias. After excluding duplicates, the literature search returned 179 publications (see Figure 1). Sixty two were excluded during screening of abstracts. One hundred and eighteen publications were assessed for eligibility, of which 94 did not match the inclusion criteria. In total, eleven studies were included in the systematic analysis, assessing the effects of various medicinal cannabis products on relevant outcomes. Roila et al. 2016 MASCC and ESMO guideline update. Cotter, J. Efficacy of Crude Marijuana and Synthetic Delta-9-Tetrahydrocannabinol as Treatment for Chemotherapy-Induced Nausea and Vomiting: A Systematic Literature Review. in Oncology nursing forum. 2009. Phillips, R.S., et al., Antiemetic medication for prevention and treatment of chemotherapy-induced nausea and vomiting in childhood. The Cochrane Library, 2010. Smith, L.A., et al., Cannabinoids for nausea and vomiting in adults with cancer receiving chemotherapy. The Cochrane Library, 2015. Chan, H. S., J. A. Correia and S. M. MacLeod (1987). "Nabilone versus prochlorperazine for control of cancer chemotherapy-induced emesis in children: a double-blind, crossover trial." Pediatrics 79: 946‑952. Zutt, M., et al., Dronabinol for supportive therapy in patients with malignant melanoma and liver metastases. Der Hautarzt; Zeitschrift fur Dermatologie, Venerologie, und verwandte Gebiete, 2006. 57: 423‑427. The Mayo Clinic. Marijuana (cannabis sativa) - dosing. Drugs and supplements 2013 Nov 1, 2013 [cited 2017 April 3]; Available from: http://www.mayoclinic.org/drugs- supplements/marijuana/dosing/ hrb-20059701. Machado Rocha, F.C., et al., Therapeutic use of Cannabis sativa on chemotherapy-induced nausea and vomiting among cancer patients: systematic review and meta-analysis. European journal of cancer care, 2008. 17: 431-443. Lutge, E.E., A. Gray, and N. Siegfried, The medical use of cannabis for reducing morbidity and mortality in patients with HIV/AIDS. The Cochrane Library, 2013. Santana, T.A., et al., Meta-analysis of adjunctive non-NK1 receptor antagonist medications for the control of acute and delayed chemotherapy-induced nausea and vomiting. Supportive Care in Cancer, 2015. 23: 213-222. 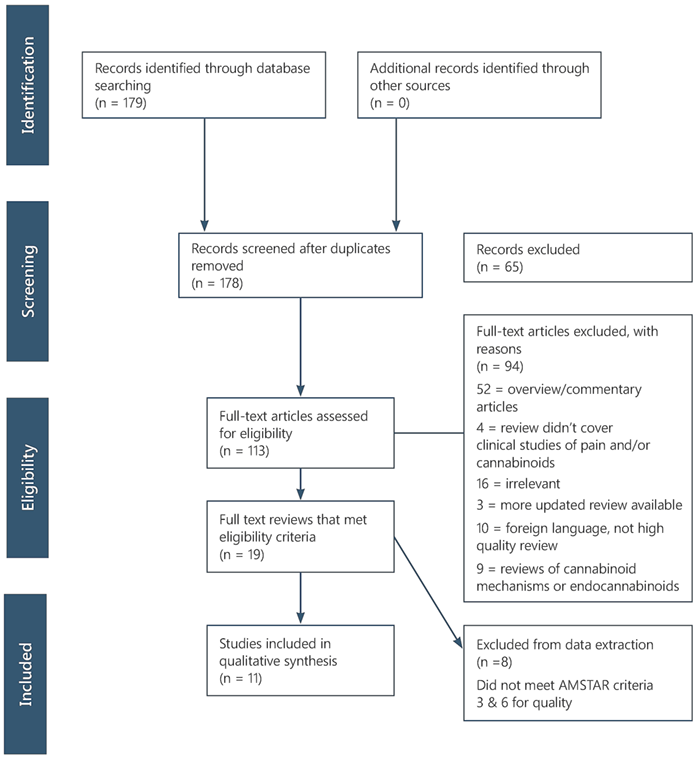 Whiting, P.F., et al., Cannabinoids for medical use: a systematic review and meta-analysis. Jama, 2015. 313: 2456‑2473. Benze, G., et al., Treatment of nausea and vomiting with 5HT3 receptor antagonists, steroids, antihistamines, anticholinergics, somatostatin antagonists, benzodiazepines and cannabinoids in palliative care patients: a systematic review. Schmerz (Berlin, Germany), 2012. 26: 481‑499. Santana et al., Meta-analysis of adjunctive non-NK1 receptor antagonist medications. Orr, L.E., J.F. McKernan, and B. Bloome, Antiemetic effect of tetrahydrocannabinol: compared with placebo and prochlorperazine in chemotherapy-associated nausea and emesis. Archives of Internal Medicine, 1980. 140: 1431-1433. Phillips et al., Antiemetic medication. Zutt et al., Dronabinol for supportive therapy. Long, A., J. Mioduszewski, and R. Natale. A randomized double-blind cross-over comparison of the antiemetic activity of levonantradol and prochlorperazine. in Proc Am Soc Clin Oncol. 1982. The Mayo Clinic. Marijuana (cannabis sativa) - dosing. Zhornitsky, S. and S. Potvin, Cannabidiol in humans - The quest for therapeutic targets. Pharmaceuticals, 2012. 5: 529-552. Machado Rocha et al., Therapeutic use of Cannabis sativa on chemotherapy‐induced nausea and vomiting. Orr et al., Antiemetic effect of tetrahydrocannabinol. Chang, A.E., et al., Delta-9-tetrahydrocannabinol as an antiemetic in cancer patients receiving high-dose methotrexate. Annals of Internal Medicine, 1979. 91: 819-824. Jhangiani, H., et al., Dronabinol or ondansetron alone and combined for delayed chemotherapy-induced nausea and vomiting (CINV). Blood, 2005. 106: 5555. Lane, M., et al., Dronabinol and prochlorperazine in combination for treatment of cancer chemotherapy-induced nausea and vomiting. Journal of pain and symptom management, 1991. 6: 352-359. McCabe, M., et al., Efficacy of tetrahydrocannabinol in patients refractory to standard antiemetic therapy. Investigational new drugs, 1988. 6: 243-246. Meiri, E., et al., Efficacy of dronabinol alone and in combination with ondansetron versus ondansetron alone for delayed chemotherapy-induced nausea and vomiting. Current medical research and opinion, 2007. 23: 533-543. Melhem-Bertrandt, A., et al., A randomized, double-blind, placebo-controlled trial of palonosetron plus dexamethasone with or without dronabinol for the prevention of chemotherapy-induced nausea and vomiting after moderately emetogenic chemotherapy. Unpublished manuscript, 2014: p. 1-23. Orr, L.E. and J.F. McKernan, Antiemetic Effect of Δ9‐Tetrahydrocannabinol in Chemotherapy‐Associated Nausea and Emesis As Compared to Placebo and Compazine. The Journal of Clinical Pharmacology, 1981. 21(S1). Sallan, S.E., et al., Antiemetics in patients receiving chemotherapy for cancer: a randomized comparison of delta-9-tetrahydrocannabinol and prochlorperazine. New England Journal of Medicine, 1980. 302: 135-138. Sallan, S.E., N.E. Zinberg, and E. Frei III, Antiemetic effect of delta-9-tetrahydrocannabinol in patients receiving cancer chemotherapy. New England Journal of Medicine, 1975. 293: 795-797. Ungerleider, J.T., et al., Cannabis and cancer chemotherapy: A comparison of oral delta-9-THC and prochlorperazine. Cancer, 1982. 50: 636-645. Ahmedzai, S., et al., Antiemetic efficacy and toxicity of nabilone, a synthetic cannabinoid, in lung cancer chemotherapy. British Journal of Cancer, 1983. 48: 657. Dalzell, A., H. Bartlett, and J. Lilleyman, Nabilone: an alternative antiemetic for cancer chemotherapy. Archives of disease in childhood, 1986. 61: 502-505. Einhorn, L.H., et al., Nabilone: an effective antiemetic in patients receiving cancer chemotherapy. The Journal of Clinical Pharmacology, 1981. 21: 64S-69S. Herman, T.S., et al., Superiority of nabilone over prochlorperazine as an antiemetic in patients receiving cancer chemotherapy. New England Journal of Medicine, 1979. 300: 1295-1297. Johansson, R., P. Kilkku, and M. Groenroos, A double-blind, controlled trial of nabilone vs. prochlorperazine for refractory emesis induced by cancer chemotherapy. Cancer Treatment Reviews, 1982. 9: 25-33. Jones, S.E., et al., A multi-institutional Phase III study of nabilone vs. placebo in chemotherapy-induced nausea and vomiting. Cancer Treatment Reviews, 1982. 9: 45-48. Niederle, N., J. Schütte, and C. Schmidt, Crossover comparison of the antiemetic efficacy of nabilone and alizapride in patients with nonseminomatous testicular cancer receiving cisplatin therapy. Journal of Molecular Medicine, 1986. 64: 362-365. Niiranen, A. and K. Mattson, A cross-over comparison of nabilone and prochlorperazine for emesis induced by cancer chemotherapy. American Journal of Clinical Oncology, 1985. 8: 336-340. Pomeroy, M., J.J. Fennelly, and M. Towers, Prospective randomized double-blind trial of nabilone versus domperidone in the treatment of cytotoxic-induced emesis. Cancer chemotherapy and pharmacology, 1986. 17: 285-288. Wada, J.K., et al., Double-blind, randomized, crossover trial of nabilone vs. placebo in cancer chemotherapy. Cancer Treatment Reviews, 1982. 9: 39-44. Gschiel, B. and R. Likar, Cannabinoide in der palliativen Symptomkontrolle. Zeitschrift für Palliativmedizin, 2009. 10: 45-50. Robson, P., Therapeutic aspects of cannabis and cannabinoids. The British Journal of Psychiatry, 2001. 178: 107-115. Gloss, D. and B. Vickrey, Cannabinoids for epilepsy. The Cochrane database of systematic reviews, 2014. 3: CD009270. Shea, B.J., et al., Development of AMSTAR: a measurement tool to assess the methodological quality of systematic reviews. BMC Medical Research Methodology, 2007. 7: 1-7. Higgins, J.P. and S. Green, Cochrane handbook for systematic reviews of interventions. Vol. 4. 2011: John Wiley & Sons.